February 23-26 in Saint Louis, MO. Please continue to pray daily from 2:23-2:26 pm. • Grace UMC (119 N Frederick Ave, Gaithersburg, MD 20877-2441). Stay informed, visit the BWC website for congregational resources, videos and more. February 20, 8:30 am-3 pm. Active and retired clergy of the Baltimore-Washington Conference are invited to join Bishop LaTrelle Easterling for a special Lenten Day Apart. This event will focus on contemplative practices and will be held from 9 AM to 3 PM at Glen Mar UMC (4701 New Cut Road in Ellicott City). The cost is $35 for active clergy and $25 for retired clergy; the fee includes a catered lunch. Retired clergy must enter a special code to receive the discounted rate. Enter "RETIRED" (all caps) when you register. SIGN-UP today and reserve your seat. February 28 from 6-9 pm. DS JW Park is inviting clergy and their spouse or friend to be his guest at a festive Clergy Appreciation Dinner at Saint John United Church. The deadline to register is February 12. RSVP required, click HERE to register. March 16, 8 am-3 pm. There’s something for everyone at Leadership Day! Bring your team for a time of inspiration and equipping so that you and your congregation are better able to move forward together and joyfully. Download the EVENT GUIDE for full details and REGISTER. If you were unable to attend one of the Sexual Ethics and Boundary Trainings in January, please register to attend a make-up session. If you registered but did not attend, arrived late or left early, please contact me so I can make the change on my end. The Central Maryland District’s make-up session will be held at the Mission Center in Fulton, MD. The fee is $35 and lunch is included. It is important that every pastor attend a Sexual Ethics and Boundary training. Please feel free to contact me with any questions. REGISTER today. The Annual Meeting will be held at the Baltimore Waterfront Marriott Hotel. Registration opens February 20. This four-day session will provide time for increased youth participation on Saturday, including a confirmation rally for youth throughout the BWC. • You must first consult with Mark Gorman, Chair of the Rules Committee, prior to submitting resolutions pertaining to Rules of the Session. • For resolutions that have budget implications, you must first consult with Phil Potter, Chair of CFA prior to submitting the resolution. June 8-9 at the BWC Mission Center. Save the date. This workshop will be offered twice ~ Friday February 15, 8:30 am - 12:30 pm and Saturday February 16, 8:30 am - 12:30 pm at the BWC Mission Center, 11711 East Market Place, Fulton MD 20759. The Laity Fix is an inclusive approach to church growth. We will examine the challenges and opportunities within today’s faith communities for leaders. There are many questions that congregations face today, and leadership is just one of them. All leaders across faith communities can increase their personal leadership skills by identifying what they are and learning how to use them appropriately. We recognize that every congregation is different, every leader leads differently, and recognizing this is critical. This workshop is designed to: Explore the value of the congregational analysis; Offer strategies for sustained leadership development; and Identify growth opportunities through mission and ministry initiatives. The world has changed! What do we do now? Go to the BWC website to register. Once again, the Baltimore-Washington Conference will be awarding scholarships for qualified students currently attending college, as well as high school seniors who plan to attend college in the fall of 2019. The application process opens on Jan. 3 and closes March 7, 2019. A variety of scholarships are offered to fit the diverse needs of our students. To be considered for a scholarship, students must complete the full online application which includes uploading their current transcripts. In addition, the student must provide contact information for their pastor and one additional church reference. The pastor and reference will be contacted and asked to submit information on the student’s participation in the local church. The entire process will be done online for ease of the student, pastor, and reference. For details about the individual scholarships or to apply for a scholarship, please visit http://www.bwcumc.org/administration/local-church-resources/scholarships/. March 7, 2019, 8:30 -3PM! Join us in Annapolis for our Annual Legislative Advocacy and Action Day co-sponsored by the BWC Advocacy and Action Board and The United Methodist Women. Newbies and interested advocates, join us as we address aspects of: Health Care Reform, Criminal Justice Reform: From School to Prison Pipeline, and Immigration Reform. To register or for more information, please contact Judy Smith at . The cost for this event is $6. The BWC will host a weekend of training and renewal for youth workers Mar 22-24, 2019 at Wesley Freedom UMC in Eldersburg, MD. Whether you are new to youth ministry or a seasoned veteran, there will be training and classes appropriate for any stage of your ministry and time for restoration and renewal. Registration and additional information available at https://arenaweb.bwcumc.org/default.aspx?page=3439&eventID=4122. For questions, please contact Cheryl Cook. United to Love Moral Courage Young Adult and Adult Awards ~ Submit an Application! The United to Love Moral Courage Awards celebrate people who put their faith into action especially when doing so is uncomfortable or unpopular. If you know YAs and Adults who are boldly living their faith in ways that exemplify/advance discipleship, amplify our Social Principles, exemplify the love of Christ and illuminate God's call for justice, please invite them to apply. Applications are open now and will be accepted through April 1, 2019. For more information and/or to apply, please visit http://www.bwcumc.org/moral-courage-awards/. Applications are toward the end of the page. Awards will be presented to finalists at Annual Conference 2019. • The Harry Denman Evangelism Award for laity and clergy who many people credit for helping to start or reignite their faith journey. Learn more and apply for these Annual Conference Awards here: https://www.bwcumc.org/annual-conference-awards/. • Join us at Hobbit’s Glen in Howard County for our first Baltimore-Washington Conference sponsored SOS Golf Tournament and Gala. These events will help us to raise awareness of Domestic Violence/Intimate Partner Violence, offer greater resources, create deeper partnerships, and develop and partner with more safe havens. For ticket pricing and to register yourself or a team of four, please go to https://www.eiseverywhere.com/sosgolf19. • For tickets to join us for the Seeds of Security Domestic Violence/Intimate Partner Violence Prevention Gala to be held at Turn House in Howard County at 7 PM on Friday, April 26, 2019, please go to https://www.eiseverywhere.com/sosgolf19. We would like your voice at the table. The Baltimore-Washington Conference has six active teams to mobilize across our connection and they are: Creation Care (Climate/Eco-Justice), Gender Equality, Gun Violence Prevention, Immigration Rights, Racial Justice and Wealth Equity. If you are called to serve in one/more of these areas, if this is your passion and/or your faith community is leading in one or more of these areas, we would like to hear from you. Please go to http://www.bwcumc.org/ministries/advocacy-action/ to sign-up so that we can connect with you. Are You Called to Lead Beyond Your Local Faith Community? The Nominations Committee is seeking a few good men and women to serve in key leadership roles including in the areas of Leadership Development, New Faith Expressions, Young People’s Ministry, Abundant Health (including local and global missions, holistic health and ERT), Advocacy & Action, Native American Ministry, Gender Equality (COSROW), and the Board of Trustees. In addition to passion and experience in the above, some boards are seeking persons with expertise in training, coaching, grant administration, project management, and data analysis and evaluation. Please complete this leadership interest form and encourage gifted young leaders (30 or under) to do the same: https://www.bwcumc.org/conference-agency-leadership-nominations/. 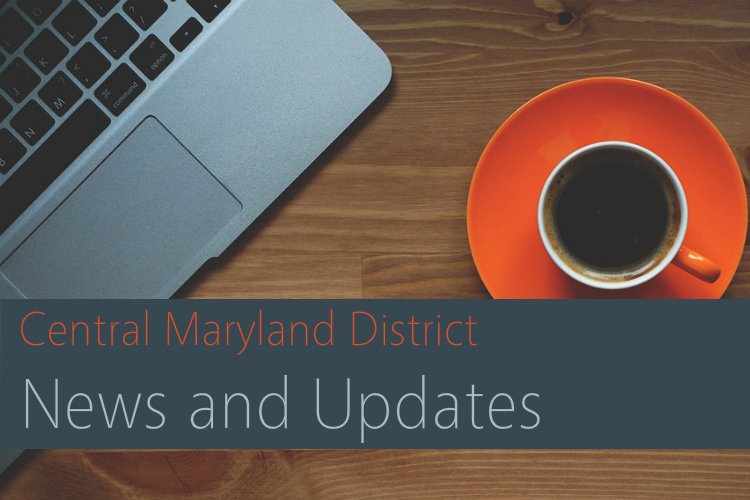 Download the Central Maryland District calendar for more opportunities to learn and network.